I love this time of year as everyday there is a new discovery of something flowering in the garden. Both plum trees are in blossom, I’ve started to see patches of blue grape hyacinth, sunny yellow daffodils and I have been picking posies of violets from underneath the cherry tree. In the Victorian era there was a resurgence in using the meanings of flowers to convey messages and emotions. 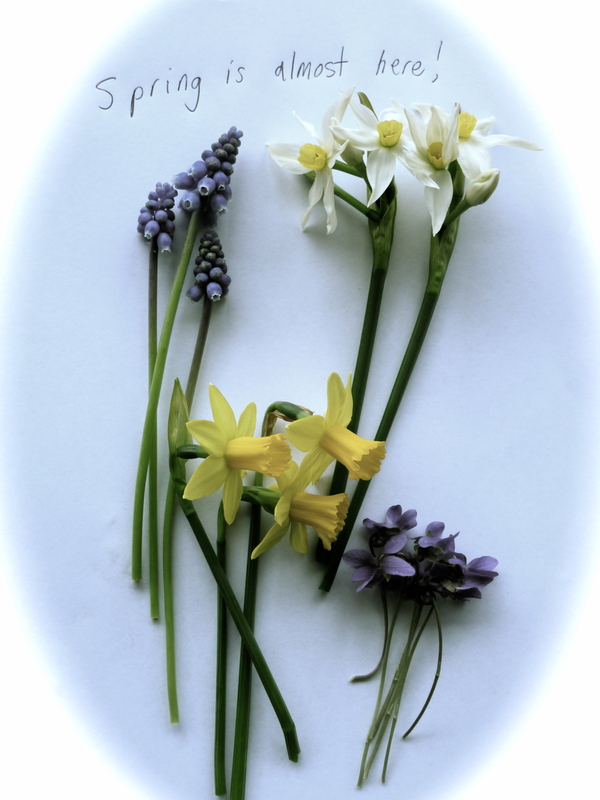 Hyacinths symbolised sincerity, daffodils chivalry and violets meant faithfulness or ‘I’ll always be true’ – although if the violets were white they sent an all together different message – ‘lets take a chance’. I recently read the novel ‘The Language of Flowers’ by Vanessa Diffenbaugh. Set in the present the protagonist uses flowers to engage with the world around her and nurture her own wounded soul. Believing in the power of the language of flowers she discovers she has a gift she can share and that will also bring her redemption. I enjoyed the story and loved the wonderful descriptions of flowers – growing them, choosing them, arranging them and giving them. Having meaning attached to each flower was an enchanting way of threading the storyline together. I’ve also read it and really liked. 🙂 Your creations are beautiful! Best wishes, L.